Tech N9ne continues to bring the weirdest and most innovative visuals to his music videos. As he confirmed earlier this week, Tech was busy shooting a music video for his brand new single, “He’s A Mental Giant”. No details were given when Tech updated on Twitter, but during a late night tweet, he decided to share some photos from the set. 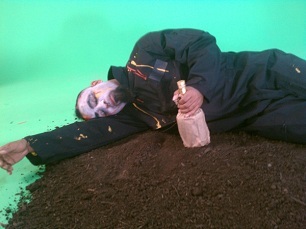 Tech is shown over a mound of dirt with a bottle in his hand. He stated that it was his “drunk wicked clown in this twisted Wizard Of Oz video“. Could this be the first glimpse of an All 6’s And 7’s music video? We will keep you updated as more becomes available on Tech N9ne’s “He’s A Mental Giant”.